The food that you swallow travels down your throat and is pushed by contractions of the muscular oesophagus. In the area where the oesophagus joins with the stomach, a valve-like mechanism, known as lower oesophageal sphincter (LES), is located. The closure of this muscle prevents the stomach acid from moving back, or refluxing, into the oesophagus. LES malfunction is the first factor that causes and contributes to gastro-oesophageal reflux disease. In a healthy individual, the LES relaxes only when food passes from the oesophagus into the stomach. After the food passes into the stomach, the valve closes, keeping the stomach-content and the acid inside. However, when the LES is weak and doesn't close properly, the acid can splash up to your throat causing a painful burning sensation, called heartburn. There are numerous approaches for treating symptomatic acid reflux. However, popular conventional treatments, based on prescribed medication and over the counters, merely treat the symptoms of chronic heartburn. These treatments might not be effective enough to ensure a long-term prevention of acid reflux. Not only do conventional treatments fail to heal and protect the oesophagus adequately, long-term use of prescription drugs and over the counters, including certain antacids, can lead to a myriad of side effects ranging in impact from uncomfortable to dangerous. To treat acid reflux effectively, you have to treat the factors which are specific to you in causing the disease. For example, if faulty eating habits are causing acid-reflux in your body, it would be no good taking medicines with harmful side-effects to tackle the problem, unless you change your eating habits in the first place. Since acid reflux tends to trace its roots to a host of physical, medical and life-style factors, the best way to attain a long-lasting relief is to go for an all-natural holistic treatment, that works with the natural functioning of the body, and addresses each of the contributing causes. Holistic treatment DOES NOT cause side-effects and deals with the problem, instead of the symptom. 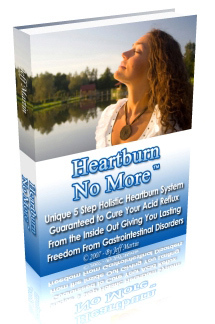 It is the best way to restore your healthy self by preventing the reflux mechanism forever.